On the island of Sumba textiles are essential items for bride wealth (a reciprocal exchange of goods made between the bride’s and groom’s families), funerary rites and expressing social status. According to traditional Sumbanese belief (‘marapu’), which orders the entire cosmos in terms of complimentary dualisms, textiles are feminine items associated with the fertile, cool and watery underworld. During elaborate marriage negotiations, hand-woven ikat textiles are given by a bride’s family to the groom’s in exchange for male goods such as gold ‘mamuli’ ornaments and livestock. ‘Hinggi kombu’ are worn wrapped around the body or folded over the shoulder and are distinguished by bold designs of human and anthropomorphic figures, imagery of the male items exchanged for female goods, and motifs inspired by the natural and supernatural world. 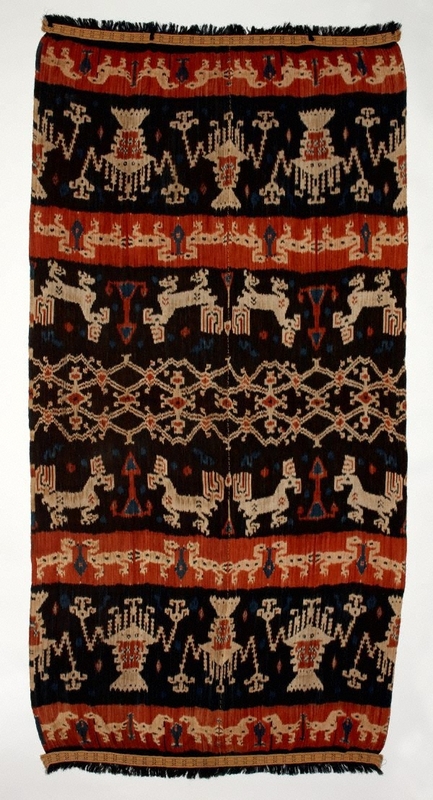 The design of this textile was achieved using the ikat technique in which the desired pattern is tied and dyed into the cotton threads before weaving. It features symbols denoting high status and the mythical power of founding ancestors. These include large-antlered deer interspersed with stylised tree motifs, chickens clasping sacred ‘mamuli’ ornaments, and crayfish symbolising the underworld and the aristocracy. The central band shows a floral lattice or ‘patolu ratu’ design, a common feature of Sumbanese ikat textiles inspired by Indian trade textiles.